Thumper was the first experience that we had with PlayStation VR at PAX East. And boy, what a first impression to make! In development for six years, the two-man team at Drool – Brian Gibson and Marc Flury, both former Harmonix devs – gave us some hands-on time with their VR rhythm game, and the experience was nothing short of sublime. 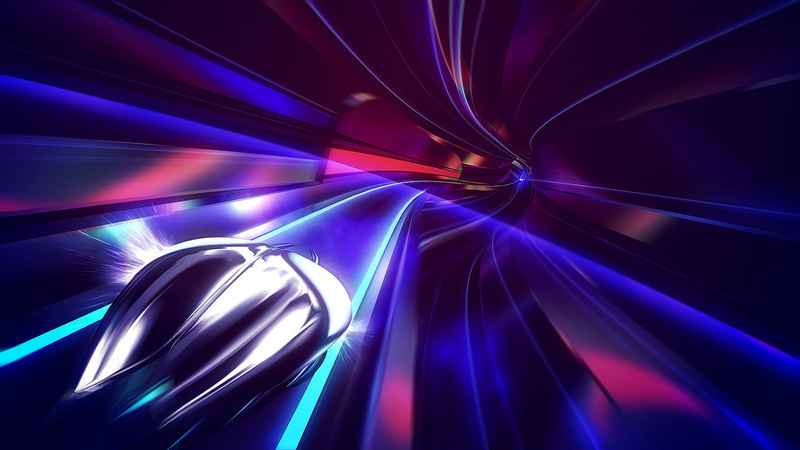 Described as a rhythm-violence game, you assume the role of a chrome beetle speeding down a track to the beat, as you whip past what can only be described as a neon-drenched fever dream mixed with Tron. The game makes an incredible first impression, and the excitement never really lets up from there. An impressively intuitive control-scheme allows for the game to be picked up and played almost immediately, and once you do, you just may find that you never want to put down the controller or take the headset off – if you're playing the VR version that is. As the game has been in development for six years, it wasn't originally intended as a VR game, which is something that we took the time to query Gibson about. While the release wasn't originally envisioned for VR platforms, he talked about how, as VR started gaining steam and public attention, transitioning the title over to VR just seemed like the right to thing to do. The title is very much still playable in the standard way, and this version has its own advantages. When banking around turns, the camera has a tendency to whip around corners, and the camera is just a lot livelier in general. This is something not present in the VR version, due to motion-sickness concerns. While we did like the non-VR version, we were absolutely stunned by the iteration with the PlayStation headset. 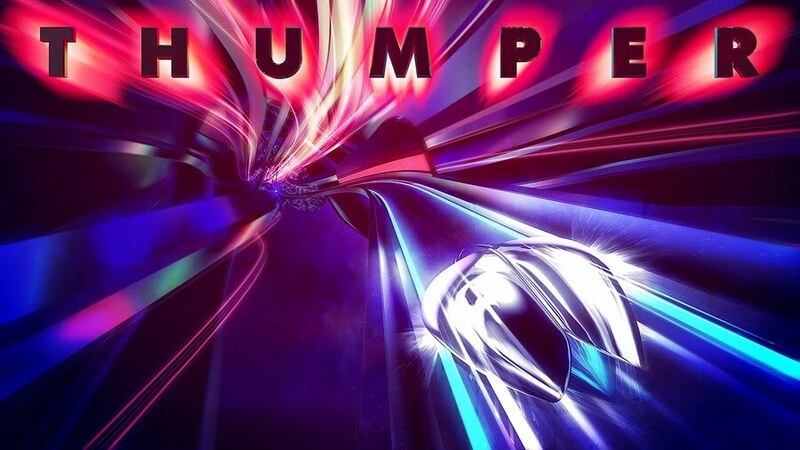 This game is responsible for a rather dynamic shift in this author's stance on VR; Thumper made your humble host realise that he needed the new tech. This change in stance on VR occurred for several reasons. Being essentially inside of the visuals is a part of it, but the scope of those visuals also plays a part. Being in the middle of a game, and looking up into the distance and seeing the rest of the level where you're headed is an amazing thing to witness. Of course, being a nifty experience is all well and good, but the game should also be a good, er, game. Fortunately, Thumper is not just a cool VR experience, but it's also a good rhythm game. The types of "notes" that you have to hit and their frequency and difficulty ratchet up in an appropriate difficulty curve, and by the time that we came away from our demo with the title, we felt like it might actually be harder to not have a good time with this than to have one. As we continue to inch closer and closer to the launch of PlayStation VR, Thumper is a game that should be at or near the top of your list of games to nab as soon as you can. 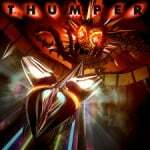 Do you think that Thumper sounds slammin' on PlayStation VR? Strap yourself in to a different dimension in the comments section below. I played the non-VR version of this last year. It is a very cool game. I can't believe it's been in development for six years, though. Really? Good to see developers make non-VR versions, some of us don't want to wear a helmet in our living rooms. But yeah, six years, no judgement on its fun factor, but it looks like a HD version of that PS1 game, N20: Nitrous Oxcide, or whatever the hell it was called.....the game with the Crystal Method soundtrack. People won't be able to afford a PSVR they gotta save for PS4k..how much will this game sell for? Look's like a £15 jobby, certainly won't get me to pay more than that, it's not my cup of tea. Ok. Good. There's one game I can look forward to on VR. Not the golden game I'm waiting for, but it's a start. @get2sammyb Yeah it's a damn long time! @xMEADx Pricing, I'm not sure unfortunately. VR game pricing can be hard to gauge this early on. It's pretty much look at Steam and assume the PSVR version will cost the same. And Thumper doesn't have a price there yet either. $15 or $20 would be my first though but I don't know. Wow. I am all in. PS VR that is. This game though will be the one to avoid for me. Or I should have a really big bucket next to me while playing. @Neolit Motion sickness was a non-issue while playing for me. I'm not sure if that was my high tolerance for motion rides and such, or the game itself that helped there though haha. @Neolit I have my PSVR pre-ordered (so I am excited for VR games) but me and my wife both watched videos on this game and just cannot understand how it could be enjoyable, let alone a reason to play VR. It looks like a half-finished version of Amplitude (which we enjoy quite a bit). Maybe its different when actually playing, but from everything I have seen, this seems like a title to avoid. @thedevilsjester same here, psvr preordered. This game, although I can see the draw, will not touch my ps4 because my life insurance does not cover death due to vomit suffocation. Nope.